And look at what came out of the wood works. ‘Skelewu’ one of the hottest Afrobeat dance songs of 2013 has now got a remix to it. Remixed by Diplo's Major Lazer and DJ Wiwek comes a hot game changing EDM remix to the upbeat Afrobeats single. Major Lazer is already known for their electronic, dancehall, reggae fusion, hip hop influenced music and Wiwek a Dutch DJ for his infused remixes to hit singles across the world. ‘Skelewu’ which was originally due for it's official UK release in March has been pushed to May 12, and will hopefully be a chart success. Already a #1 smash hit on the UK club charts, ‘Skelewu’ (name of the dance) was originally produced by Davido's in-house producer Shizzi. 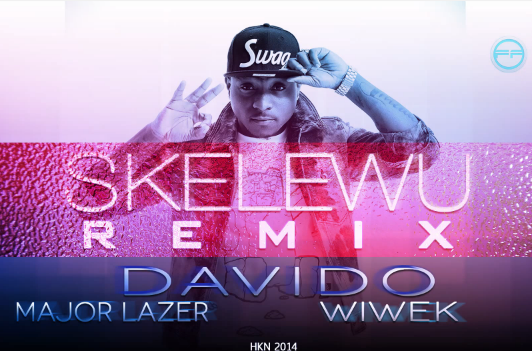 Not just bringing us a remix alone - Davido, Major Lazer and Wiwek have also released a music video to the ‘Skelewu’ remix, with a mash-up of some of the best ‘Skelewu’ videos on the net. You can't beat this! ‘Skelewu’ by Davido is arguably the biggest Afrobeat song on the UK radio right now and the smash hit is available for pre-order on iTunes: https://itunes.apple.com/gb/album/skelewu-single/id836490667?ls=1 and will officially be released on May 12. You can also watch the video to the ‘Skelewu’ remix below!